Why do you deceive people about privacy? Let's focus on building trust. Let's be honest about what we do and why do it. Lately, privacy has come under increased pressure, and we are now faced with a situation where people fear the internet because of the many ways people's privacy can be violated. What most people don't realize is that tracking is also what makes the internet so much better for us. Tracking is what allows you to read my post over at Google+, because without tracking Google would have no idea that you wanted to follow me. Same with advertising. If you are a single guy, would you want to be constantly bombarded with ads for diapers? No, of course not. Ads are annoying enough already... at least they should be relevant, right? But the advertising industry is shooting themselves in the foot. Instead of being honest about the advantages of positive tracking, they are still deeply focus on deception and trickery. How can you trust someone who are deliberately trying to deceive you every day? The latest story comes from Business Insider, "Apple Has Quietly Started Tracking iPhone Users Again, And It's Tricky To Opt Out"
Apple has enabled IFA and IDFA tracking (which not a bad thing at all)... but in so doing, they have deliberately implemented it in a way that creates an untrustworthy relationship. 1: iOS 6 comes in a default tracking on position. You have to affirmatively switch it off if you do not want advertisers to see what you're up to. 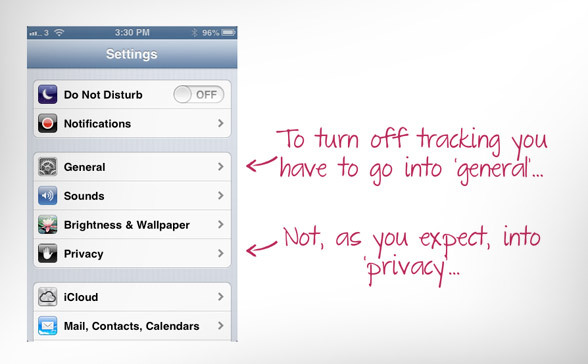 2: The tracking control in iPhone's settings is NOT contained where you might expect it, under the 'Privacy' menu. Instead, it's found under 'General,' then 'About,' and then the 'Advertising' section of the Settings menu. 3: The tracking control is titled 'Limit Ad Tracking,' and must be turned to ON, not OFF, in order to work. That's slightly confusing ... 'ON' means ads are off! ... so a large number of people will likely get this wrong. Every single step is designed to deceive. It's presence is not made known. The setting in deliberately placed in the least likely place people would ever look, and it's labeled to confuse people. Is this how we want to build trust? Is this how we want to let people know that we want to help them? Please stop deceiving our customers. IFA and IDFA is actually a pretty good thing. It's anonymous, but it still allows people to track for instance call to actions. Why the deception? Why not turn it into the positive thing that it is. A tool that we can use to create more relevance. And an honest choice. What do you think happens when ordinary people read Business Insiders article? All they see is the deception, which means that the next step is that they take out their iPhone, go into Settings => General => About => Advertising (which is listed at the very bottom of a long list), where they will turn it ON to turn it off. I just did it myself. Why? Because how can I trust this when then tried to deceive me? Head over to my Google+ post to comment and discuss this article.